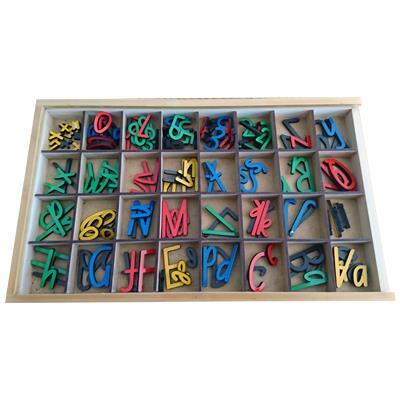 Magnetic alphabet and numbers in a self contained storage box with magnetic lid. Small Magnetic Upper case (2 of each letter) and lower case letters (4 of each consonants and 8 vowels) and numbers (5 of each plus signs) in the chosen state font stored in a divided box with a magnetic lid. Ideal for individual letter recognition and word building. or 2 Letters in red consonants and blue vowels and green numbers. Additional letter packs and can be purchased. 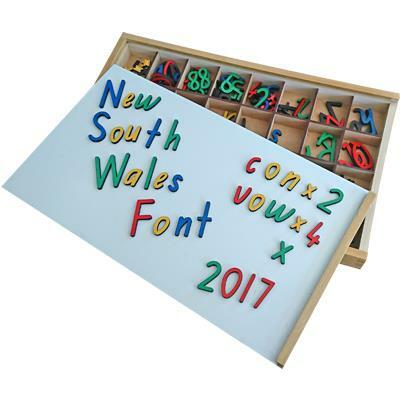 The box is 1 layer divided into 32 sections with a slide on magnetic lid.and will hold a set of letters (included) and 1 extension pack (can be added) and the numbers and signs. Overall size of box is 36.5cm x 22 cm.